Interview with No Nonsense Airsoft, News and Reviews! "Recently we spoke to Kelly from Femme Fatale Airsoft and we had the opportunity to ask her a few questions. Here is what she said!" NNA: When did you start Airsoft? 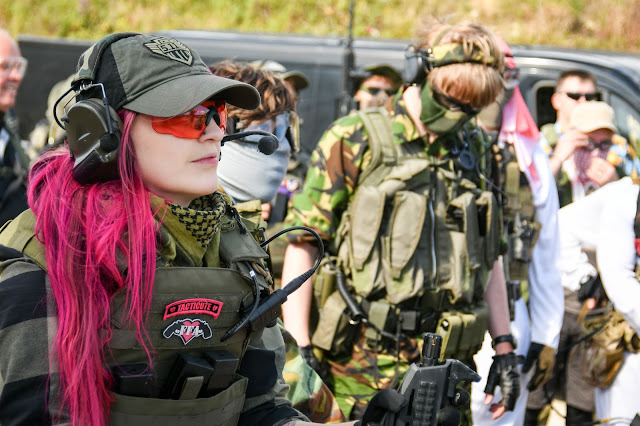 Kelly: My very first Airsoft game was in February of 2011 for one of my female best friend’s birthday at a woodland site near Nottingham, which I enjoyed but I was just a newb borrowing my boyfriend’s kit which put me off a little. I didn’t play again until August of 2014 (so a year ago now), when a couple of my friends held a private Airsoft skirmish for their birthday at a local site, this time I had my own gun - the G&G FF26 and my own kit, which made the day a more comfortable experience. I fell in love with the sport. I started playing once a month at our local site and even started a team. I left my team earlier this year but I now play every weekend up and down the country at different sites with groups of amazing people that I have met through the sport. NNA: What made you want to start Airsoft? Kelly: In my spare time, I’m quite a big gamer and over the years I have played a lot of Call of Duty and other first person shooters so when Airsoft was explained to me I thought ‘That sounds awesome!’ so I gave it a go and absolutely loved it. I also loved the idea of building a load out that was completely unique to me. NNA: Gender split in Airsoft is obviously male-heavy. Do you think that the sport is as accessible to ladies as it should be? Kelly: I think Airsoft is accessible to everyone regardless of gender etc. however it could be more accessible and I think that this will come when player attitudes start changing towards females in the sport – we’re players in our own right, we can keep up and we play just as hard as the guys. I have experienced a few different reactions on the field, from catcalling, sexist jokes and even ‘jokes’ referring to sexual violence but these have been very few and far between thankfully. At most sites however, I am treated like any other player, which is exactly what I want. Female Airsofters don’t need or want special treatment, we want to be treated as equals. NNA: Are there ways in which you think we could get more female players involved in Airsoft? Kelly: Absolutely! I’ve known some sites to operate game days where wives/girlfriends/female friends play for free, which is pretty cool because it gives them a chance to play with nothing to lose. I don’t think the female community is big enough for sites to offer women only game days but that is something I would love to see. I think the best advice for anyone wanting to get more females involved in the sport is to talk passionately about it with them. NNA: What are your favourite and least favourite aspects of Airsoft in the UK as it currently? Kelly: My favourite and least favourite aspects of the Airsoft community in the UK as it currently stands are the players. They are my favourite aspect because through travelling the UK and playing different sites I have made what I hope to be lifelong friends with loads of awesome people who I run alongside regularly and have the best Airsoft weekends with. One of my favourite things is meeting and chatting to new people. But the players are also my least favourite aspect because there is a lot of drama and a general lack of respect amongst players – many will disagree with me on that but we are a very small community that gets attacked on a regular basis because of the sport we play, we really need to look out for each other and stick together. NNA: Skirmish or MilSim and why? Kelly: At this very moment in time, I would say Skirmish as I haven’t had chance to play a MilSim yet. I do however have 2 MilSim’s planned for the near future – Spartan CQC Zero One Thirty 31 hour MilSim at the end of August and Warzone’s 35 hour Op Sledgehammer in October, which I’m really looking forward to as they will be a completely different style of play than I am used to and will test me mentally, physically and my abilities as a player. I’m always looking for ways to improve as a player and experiencing MilSim gameplay will definitely help. NNA: You have mentioned in the past wanting to create a brand of airsoft-suitable tactical clothing for ladies who pew. Can you give us any information about how that idea has progressed? Kelly: Throughout the time I have been Airsofting I have found it difficult to find kit – UBACs and combat trousers that fit me well because of my small stature, so I decided to design a line of tactical clothing for women in women’s sizes. I drew up the designs and made the patterns ready for the clothing to be made – I got really good feedback from women in the Airsoft community regarding the designs but with the growth of FFA, my two jobs and becoming a carer to my Grandfather, the idea was put on hold until I have more time to dedicate to it. NNA: What's your dream Airsoft gun and why? NNA: What is your current Loadout? Why do you wear the kit you do? Kelly: My current load out is from top to toe is: Nuprol Black FAST Helmet with my GoPro set up, black mesh goggles and half mesh face mask and a pink shemagh – I wear mesh goggles as I find lenses steam up quite a bit and I wear full face because I only had my braces taken off in April – I definitely don’t want to lose any teeth! On my top half I wear a MTP UBAC and my Warrior Assault Systems Recon Plate Carrier in the shooters cut (complete with a tactical Hello Kitty) – I will admit I was very reluctant to spend so much on a Plate Carrier but I have found it difficult to find one to fit, the Warrior Assault Systems Recon Plate Carrier though fits me perfectly because it’s quite small, completely adjustable and the shooters cut makes it a lot easier to shoulder my rifle – It’s definitely been a worthwhile purchase! On my lower body I run a pair of Viper Vcam Elite Combat Trousers with built in knee pads (great for those power slides in CQB which I’m quite fond of! ), a Nuprol Retention Holster and drop leg set up for my WE Gen 4 Glock 18C and also a Fobus holster for my WE M&P – I run two pistols simply because I couldn’t choose which one to run because I like them both so much so I thought ‘two pistols? Why not!’ and my Viper Vcam Recon boots. NNA: Do you prefer playing in a team of being a lone wolf? Kelly: I prefer playing in a team, for definite. As I’ve said, I left my team at the beginning of May this year, and initially I was a little worried about going to sites on my own but I’ve made some great friends at the different sites I’ve played at. Now I squad up with players on the day at sites and I’ve been lucky to run with some great players and teams. NNA: In the future of airsoft as a whole, what part do you think that you and your blog will play? 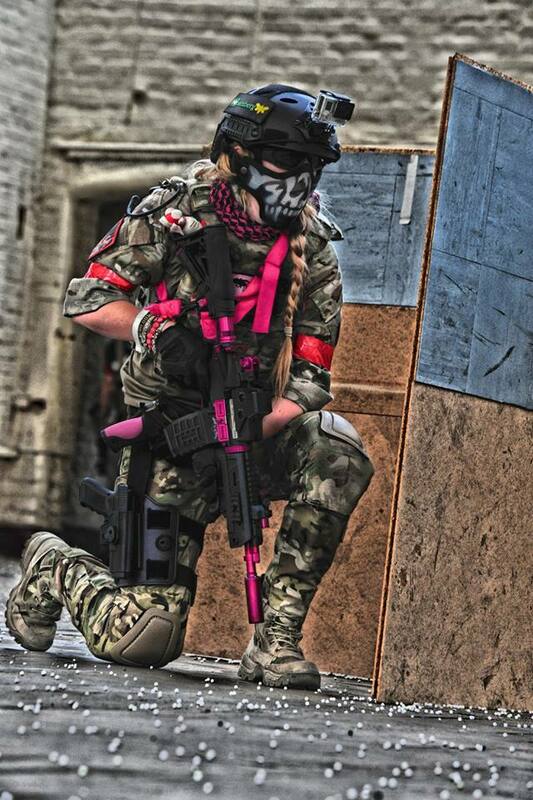 Kelly: My vision for Femme Fatale Airsoft has always been to encourage and support female players, to get more women into the game by making Airsoft more accessible through information available to them! Whether it be on kit or sites to visit, which FFA will continue to be. As for me, I have been working hard on getting women on par with the guys in the Airsoft scene in the UK. I became the first female admin to the UKAC earlier this year, which is the biggest community of UK Airsofters on Facebook and I have recently become a writer for Airsoft Action, which I absolutely love – I am currently the only female contributor to a UK Airsoft publication. These are massive steps for women in our sport, as it means the industry is moving forward with us. Women are the fastest growing demographic in shooting sports and it’s important that we are represented too. I have received emails from male players saying because of my blog, the ladies in their lives have given Airsoft a try and they’ve loved it – this makes me feel really humble but also fills me with pride. I want to keep driving the industry forward and see other women follow in my footsteps, and I want to continue to be an advocate for gender equality in sport. NNA :And finally, what is your favourite flavour of cookie? Kelly: It’s a hard choice between double chocolate or oat and raisin. But I think if push came to shove and I could only eat one for the rest of my life it would be oat and raisin. Many thanks to Kelly for stopping by and having a chat with us! Head over to her blog and numerous social media pages and show her some support!